In every synagogue service, Jews recite a special prayer called “the Mourners Kaddish.” According to Jewish law, it is mandatory for every Jew to recite the Mourner’s Kaddish every day for one year after the death of a spouse, child, sibling, or parent. The prayer comes at the end of every prayer service. Three times a day, Jews across the world solemnly intone the famous lines: Yitgadal v’yitkadash, shmei Rabbah… It is universally accepted that during this prayer, the mourners rise. What is less certain is what the rest of the congregation should do while the mourners stand. The custom in my synagogue is for those not in mourning to sit, and indeed in most American synagogues it seems this is the prevailing minhag. Hence, for most of my life, I sat during the Mourner’s Kaddish, and watched as the mourner’s stood and made their prayer. In high school, I joined United Synagogue Youth, the conservative youth movement. At sub-regional and regional conventions, as well as other programs and retreats, I was surprised to see how many of my peers stood during the Mourner’s Kaddish. I knew most of them were not actually mourning a close relative, and wondered why they chose to stand. After seeing it over and over again, I realized that I, too, wanted to stand during Mourner’s Kaddish, as did many of my friends and both of my siblings. Since it is a break from my family’s custom, it is important for me to have compelling reasons for this change. We rise for a host of reasons. On one level, we do it to stand in solidarity with the mourners. In many synagogues, I’ve often noticed that people have a tawdry habit of gossiping over others losses: “I didn’t know she was mourning; I wonder who died?” To eliminate this opportunity, we stand shoulder to shoulder with the mourners to afford them respect and dignity, and to acknowledge that every loss is the community’s loss. We also do it for ourselves. We rise during the Mourner’s Kaddish to remember the loved ones we’ve lost over the years, and the countless other departed souls whose spirits deserve commemoration: the victims of the Holocaust, our soldiers overseas, innocent people killed by famine, war and disease. As I stand in synagogue during the Mourner’s Kaddish, the physical act raises me into the community of mourners, and I engage in a profound moment of reflection. Today was Yom Kippur, the Jewish Day of Atonement, and my brother David and I attended services at the conservative student-led services at the University of Pennsylvania Hillel House. As I stood to stand during the Mourner’s Kaddish, I was reminded of a moment earlier this year when two of my friends and I visited Arlington National Cemetery. It was a day of bizarre weather. We arrived on a beautiful autumn afternoon, the sun shining, and the temperature warm enough for shorts and lights sweaters. As we made our way through the cemetery up to the Robert Lee House that dominates the top of the hill, the wind picked up, and in what seemed like only a few minutes, the sky darkened with clouds, then opened up with powerful rain. David, Gina and I tried to hide under some bushes to wait out the storm, but a park ranger told us we could not sit there, so we got up and made a dash for the shelter beneath the awning before the House at the top of the hill. When we made it, we were greeted with a spectacular view with Washington DC and the banks of the Potomac. Only a few miles away, broad shafts of sunlight pierced through the scattered clouds, bathing the city in an ethereal, intermittent radiance. The eerie quiet of the cemetery with its endless, undulating rows of white tombstones spread out before us on the banks of the hills instilled in me a deep sense of spiritual connection with the dead, and with God who gives and takes away the awesome gift of life. Despite the rain, I was determined more than ever to achieve our goals for the day: to visit JFK’s resting place, watch the changing of the guard at the Tomb of the Unknown Soldier, and pay my respects to our soldiers killed in Iraq at the part of the cemetery where their bodies are being buried. With the rain calming to a misty drizzle, the first two items on our agenda were fairly easy to accomplish. We stood by the eternal flame that burns at JFK’s tombstone, and watched the changing of the guard with dozens of others in deep silence. When it was finished, the sky was darkening. The rain seemed to be picking up. We could have gone home, but I was determined to find where our soldiers are being buried, to see their graves and make the reality of this terrible Iraqi War as real and immediate to me as it is to the families of our brave soldiers who are still dying there to this very day. Buoyed by David and Gina’s will to accompany me in this task, we set off in search of the grave plot. This was no easy task. 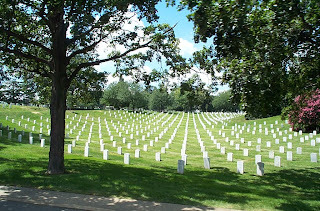 Arlington Cemetery is large and confusing. Out in the heart of the cemetery, nothing but graves and paths surround you, with the irregular tree doing little to break up the disorienting pattern of perfectly aligned rows of white tombstones. The rain was picking up, and we were getting cold. My rain-soaked map of the cemetery, with a circle around the area a guide had avowed was the final resting place I sought, seemed a poor reference to the seemingly endless plots laid out before us. Yet after what seemed an interminable search, we began to get our bearings. We were heading down the hill, and east, and the ground began to flatten out. Beyond the graves before us lay acres of untouched land. Thick shrubs rose up beyond the empty plain, where a singular bulldozer rested on the horizon like an ominous warning. Here the ground was soft and muddy. Unlike the other parts of the cemetery, the land here was low, closer to the river, more swamp-like than the solid rolling greens we experienced up on the hill. Our sneakers sank into the ground as murky water crept into our socks. Still we trudged on, scanning the crosses for the words “Operation Iraqi Freedom” that would tell us that these were the men we were looking for. Finally, almost at the very end of the cemetery, we found them. Here in the fresh, soft earth were our fellow citizens killed in Iraq, many younger then myself. The sight of their graves hit me like a kick in the stomach. Tears welled up in my eyes as I meditated on the tragedy of this war, the loss of these young men, their lives cut off short by a conflict I dread, sent to there deaths on a package of lies. As my thoughts turned to politics, a hot feeling of indignation rose up in my throat. Here lay these honorable men, these American heroes, at the shameful edge of swampiest part of the cemetery. There position seemed like a metaphor for the whole conflict: hidden down in a dark corner of our national consciousness, buried by a soft, empty field that waits ready to accept many more dead without too much of a hassle. As we wandered through the graves, we came across a Jewish star, the sign of a fellow Jew killed in this Iraq War. Almost instinctively, I gathered my friends around the grave, and then softly, tasting rain mixed with tears, began the Mourner’s Kaddish. Yitgadal V’Yitkadash Shmei Rabah… We completed the prayer, and after a few final moments in silence, we left. Though the Jewish Day of Remembrance ended today at sundown, it is never too late to take a moment to commemorate the lives of the soldiers and innocent people that have died in the Iraq War. We’re all busy people, and our lives don’t often afford us a lot of time to stand and commemorate the lost lives of those we should mourn. I hope that in some small way, this story will inspire you to take a moment to stand up and remember.